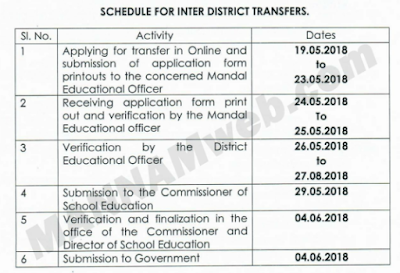 Sub:- School Education Dept., - Inter - District Transfer of teaching staff of School Education Dept.-Proposals called for - Extension of dated for applying inter district transfers - Reg. Read:-1. Govt. memo No: 14022/70/2018,Services.11,SECT, Dated: 11.05.2018. 2. This office Procs.Rc.No: 686/Estt.111/2018, dated: 16.05.2018. Teachers who are appointed in DSC-2014 and appointed up to 14.06.2016 are eligible for Inter District Transfer duly considering their joining date as 01.06.2016. The District Educational Officer concerned shall forward the manual applications of the teachers (who are working in DEO Pool and drawing salary in the against posts and now applying for IDT) in the prescribed proforma issued in Government Circular Memo.No.7232/MC-I/GAD/201 l, dated: 04.08.2011.